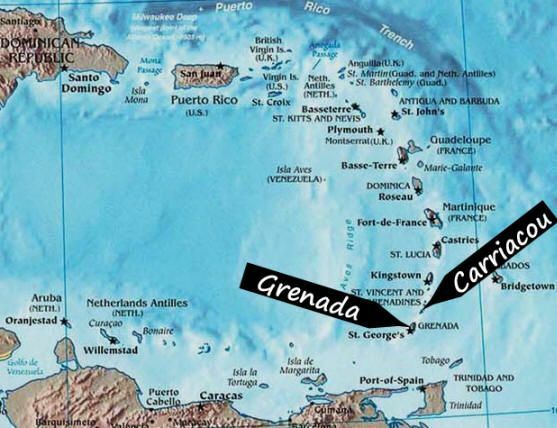 Carriacou is the southernmost Grenadine island but is technically part of Grenada. Anchored in Tyrell Bay, we spent longer than expected on the island as we waited for our special ballots for the provincial elections to be couriered to us, but this gave us the chance to take our time and explore the island. Here it is, in pictures! After 10 days of waiting for our ballots, we gave up on Elections Ontario (who sends time-sensitive mail by Canada Post??). It was time to head to Grenada, our last stop before haulout. There, we explored the capital (St. George’s), went to a Full Moon party, Mel somehow contracted strep throat, we toured a cocoa factory, and snorkeled at an underwater sculpture park before setting our sails for our first voyage – three non-stop days at sea! St. George’s is built on hills – great for the thighs! We had a great tour of the Belmont Estate with Kelly. Here he shows us a cocoa pod. And they make fresh goat cheese there! Guess who’s excited for a cheese tasting! Traditionally women would use their feet to turn the cocoa beans as they dried, so Mel and Tina gave it a go. Belmont Estate is a popular Sunday stop for everyone. These girls are partaking in a delicious sampling of hot cocoa. Where the wind takes us next: on a three-day, non-stop passage back to St. Martin via St. Barts! Lovely pictures. It must be wonderful to review these and close your eyes and be back there! What a great journey you had, and have still yet to come!